Sullivan’s Travels (1942) came out of Preston Sturges’ desire to make fun comedies after finding that the genre had become too preachy. He wrote the film with Joel McCrea in mind even though the character he was going to play may have been inspired by fellow thespian John Garfield who lived the life of a hobo for a short time during the 1930s. While the film was not as commercially or critically successful as Sturges’ previous efforts, Sullivan’s Travels has since gone on to become regarded as a cinematic classic. John Sullivan (McCrea) is a filmmaker who makes movies that provide commentary on “modern conditions,” with “stark realism,” and “problems that confront the common man.” He refuses to pander to the public. He wants to make high-falootin’ movies, much to the chagrin of the studio that wants him to churn out escapist fare. His next movie is to be called, O’ Brother, Where Art Thou?, a socially conscious story about hobos, but, as the studio executives point out, Sullivan knows nothing about homeless derelicts having always led a life of privilege. He agrees and comes up with a hare-brained scheme – pose as a hobo and live among the down-trodden for awhile in order to get a taste of what it is to be poor and needy. Sullivan gets outfitted by the studio costume department and heads out on the road with his filmmaking entourage following closely behind in a bus. He hitches a ride with a 13-year-old hot rodder and the ensuing chase results in chaos within the bus as the contents and passengers are thrown around. Afterwards, Sullivan makes a deal with his handlers – leave him alone for two weeks so that he can live among common people and then he’ll meet them in Las Vegas. Naturally, nothing goes according to plan and during his misadventures, Sullivan meets a beautiful woman (Lake) who tried to make it as an actress in Hollywood and is now flat broke. They decide to travel together and get into all sorts of hijinks. With his performance in Sullivan’s Travels, Joel McCrea demonstrates fantastic verbal sparring skills and a knack for physical comedy, which explains why he excelled at screwball comedies. He plays Sullivan as a man too smart for his own good. It’s no wonder the Coen brothers are such fans of this film. Sullivan has many of the characteristics of their protagonist playwright in Barton Fink (1991). 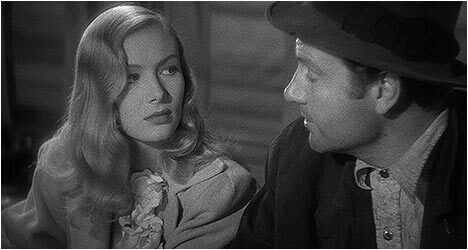 The absolutely stunning Veronica Lake is McCrea’s ideal foil, delivering a steady stream of sarcastic wisecracks at the fellow actor’s expense. She doesn’t really make for a believable hobo but that’s kind of the point and one of the several meta aspects of the film. Her adorable-looking hobo is just the kind of character that would appear in one of Sullivan’s movies. With the current economic woes that have hit the world hard in recent years, Sullivan’s Travels is still surprisingly relevant. Sturges masterfully fuses crowd-pleasing screwball antics with a clever commentary on making movies as he affectionately satirizes pompous filmmakers that make serious movies with a message and lose touch with what people want to see. It is a fun, smart film with a lot of heart. This new Blu-Ray transfer is a pleasant upgrade from the Criterion Collection’s previous DVD incarnation. While there is the occasional blemish, there is also plenty of detail with a sharp image that preserves the filmic qualities of Sullivan’s Travels. “Preston Sturges: The Rise and Fall of an American Dreamer” is a fantastic documentary that originally aired on PBS’ American Masters series in 1990. It takes a look at Sturges life and career in great detail. There is a 2001 interview with Sandy Sturges, author of Preston Sturges on Preston Sturges. She talks about the man’s beginnings as a playwright and how that informed his views of Hollywood. She also touches upon his relationships with key Hollywood players, like Barbara Stanwyck and Joel McCrea. New to this edition is a video essay entitled, Ants in Your Plants of 1941 by filmmakers David Cairns and Bill Forsyth that takes a look at the socio-political aspects of Sullivan’s Travels. Also included is a short radio interview with Sturges originally broadcast in 1951. There is another homemade recording of Sturges singing “My Love,” which was a song he composed and appeared in two of his films, The Miracle of Morgan’s Creek (1944) and Hail the Conquering Hero (1944). Finally, there is an audio commentary by filmmaker Noah Baumbach, Kenneth Bowser and actors Christopher Guest and Michael McKean, which is an amusingly affectionate appreciation of Sturges and his film.